Before I get to our fantastic interview, I have some awesome news to share. Have you heard what WriteOnCon has planned? Go to the Mundie Moms link for all the details. Doesn't this sound awesome? So get your manuscripts and pitches ready! And I'll announce the winner of PROPHECY. Congrats! E-mail me your address so I can send you your book. Please e-mail me by the end of Wednesday or I'll have to pick a new winnere. Today I’m thrilled to interview my blogger friend Leigh Moore about her newest book ROUGE that was published on November 11, 2012. Leigh’s been a follower for a long time and it’s exciting watching her writing career take off. I’ll be honest though. I don’t read romance or new adult, so I was a bit nervous when I picked up Leigh’s book. But I couldn’t put it down and finished it in two days. I loved the New Orleans Reconstruction time setting. And I loved Hale, whose goal is to create a new life for Teeny, an orphan girl she’s taken under her wings, and herself. I’m a sucker for books where the main character is a girl with few options in life but is determined to try to take more than she’s supposed to get. And it was fascinating seeing Hale’s sad world and how she’s trying to escape it. As the rising star in the hottest cabaret in New Orleans, Hale Ferrer has only one goal: Escape. Escape from the lies and manipulations, from the nonstop work and constant hunger, and from her growing fear that one day she'll earn her living in the secret back rooms, where the dancers do more than dance. But she won't go without Teeny, the orphan-girl she rescued from the streets and promised to protect. Freddie Lovel, Hale's wealthy Parisian suitor, is the perfect solution. He says he loves her, he knows nothing of her impoverished background, and he has the potential to sweep her and Teeny far away from their bleak existence in south Louisiana. If only his touch could arouse her interest like Beau's, the poor stagehand who captures her heart. Beau, who makes her laugh and feel safe, who rescues her from more than one close call, and whose blue eyes are like Louisiana iris flowers. Denying her fears, Hale is ready to choose love and a life with Beau, until a predator lurking in their theater-home launches a chain of events that could cost her everything--Teeny, their one hope of escape, and possibly even her life. Hi Leigh. Thanks so much for joining us. Like most writers, I’ve been doing this for years. My first books were terrible, with the possible exception of my graphic novel Fury Woman. I wrote that when I was about nine, and I wish I still had it. Ha ha! About me? I’m just a regular person who likes to write books. Pretty boring, actually. 2. That's awesome you've been writing since you were a kid. I enjoyed learning about New Orleans theater life and the seedy secrets parts of it during the Reconstruction time period. What made you pick the setting and historical time and what research did you do into that time period? The story of these two orphaned girls struggling to survive was my main focus at first. But then when it came time to build their world, I was faced with some choices—either it had to be a future dystopian where the government had been destroyed or it had to be in the past before child protective services. I love New Orleans and musical theater, so I opted for the past. As for research, I used the Internet for specific information on the Gilded Age. But I grew up near New Orleans, and so much of the city still has that historic feel. I used my imagination and then threw in a few elements of old musicals I like for spice. 3. Loved hearing what made you chose to use a past setting. And I'm sure it helped that you grew up near New Orleans. In YA stories, it seems there has to be some romance. And at least for me, as I’m starting into writing a YA, I’m nervous about showing these moments. You’ve done a fantastic job in showing not only romantic moments, but steamy romance. What are your tips for writing these scenes in a realistic, passionate manner? I go back and layer when I write. Like, I’ll write the scene, leave it, and then come back a few days or weeks later and read it again. Whatever feels awkward or off, I delete and then rewrite. And I read a lot, which gives me ideas. It’s hard! You have to incorporate your five senses, and you want to draw the whole thing out without it feeling fake or dumb. I guess it’s the going back part that helps. At least for me. And let others read it who’ll tell you if it’s not working. 4. Layering and using all five senses is great advice. Thanks for the tips. You didn’t shy away from some of the grittier, behind the theater curtain life of Hale, Teeny, and the other girls in the show. What were some of the challenges you faced when writing these scenes and how did you overcome them? Actually writing them was the biggest challenge. I remember emailing Matt McNish and Hart Johnson and talking to my husband. I just couldn’t hurt my characters! I kept skipping parts or inventing ways to get Hale out of bad situations. Those guys were awesome. They kicked me in the pants and then held my hand when I was in a funk for a week after writing the bad parts. 5. 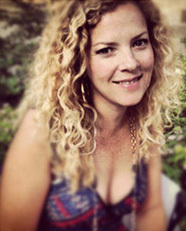 Your agent is Kate McKean of Howard Morhaim Literary Agency. How did she become your agent? Kate was my agent in 2011, but we parted ways last July. I’m currently working with Eric Myers on shopping a different book. Kate and I got together through ROUGE winning that Miss Snark’s First Victim contest. Eric and I got together through plain ole querying. He liked my new book, so we’re going to see what happens with it. 6. Awesome that you found Eric so quickly. Good luck with the new book. 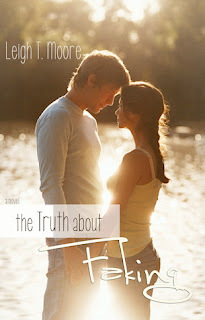 On September 1, 2012, you self-published a contemporary romance, THE TRUTH ABOUT FAKING. Tell us a bit about that book. It’s a sweet romantic comedy, very classic YA about a girl who thinks she has her whole life figured out at 16. Then she meets this great guy and he changes all her plans. It was one of the first books I ever wrote, so I love it. It’s fun to read because I think you can see my growth as a storyteller in it as well as whatever strengths I kind of started with. 7. It sounds great and I know it got good reviews. What was it like having two books release within such a short time? What were the challenges in creating a marketing plan for both? I wouldn’t advise it. Actually, if I had it to do over, I’d probably wait for January to release ROUGE. For whatever reason, FAKING blew up without much help from me, and it’s still going strong. ROUGE has been more of a slow-starter, and I think it’s been overshadowed by the first. Lots of people go, “Oh! You have another book out?” So there’s that. 8. What’re your thoughts about self-publishing vs. traditional publishing now that you’ve done both? What advice do you have for aspiring authors? I’d say always trust your gut. My instinct was to self-publish ROUGE in the fall of 2011, and I should’ve done it then. But I was scared and I didn’t know what I was doing, and my then-agent strongly advised me against it. This is a great time for writers. Traditional can be a good option, but only if you’re a priority to the publisher. If you’re offered a mediocre deal and you don’t feel much support coming your way, chances are you’d do much better going independent. And if you do go indie, do your homework and put your very best work out there. 9. It's so true that there are more options for authors right now. What are you working on now? I’m in final edits on a companion novel to FAKING called THE TRUTH ABOUT LETTING GO. I hope to have it ready for readers by the end of January, early February. And ROUGE #2 will come out in March. Wow! You're productive. Thanks Leigh for sharing all your great advice. I’m so excited for all your publishing successes. Thank you again, Natalie! This has been an interesting, fun journey! Leigh has generously offered a copy of ROUGE--e-book or print version--winner's choice--for a giveaway. To enter, all you need to do is be a follower (just click the follow button if you’re not a follower) and leave a comment by midnight on February 2nd. I’ll announce the winner on February 4th. If your e-mail is not on Blogger, please list it in your comment. And don't forget to enter my SHADES OF EARTH and DREAMING OF BOOKS GIVEWAY HOP giveaways. There are lots of great choices to pick from. The links are at the top of the blog. Wednesday, I'll be participating in Michael Pierce's blog tour and giving away a copy of PROVEX CITY, an urban fantasy told from a male POV,which also has some contemporary issues. Next Monday, I'm interviewing Marie Lu and giving away an ARC of PRODIGY, her fantastic second book in her series. I'm SO excited to share Marie's book with you because it's so good. Marie is so kind to stop by for another interview, with her busy schedule. She's already had an amazing career as an author and I can't wait to find out what's been going on with her since she became a debut author a year ago. The following Monday I'm interviewing Miriam Forster and giving away a copy of and ARC of her debut book, A CITY OF A THOUSAND DOLLS. It's a fantasy and mystery. When I got it, I picked it up to look at and literary couldn't put it down. It was fantastic and I'm excited to share it with you. Natalie, I love how you structure your interviews so interactively. And Leigh, the tip about layering is so important! I love that. It's impossible (and counterproductive) to put everything into a scene all at once when you can't even be sure the scene is going to work in context of the plot or the character arcs or the pacing. And yay for WriteOnCon! You ladies are amazing with all you do! Congratulations to Leigh, and to Llehn. The pitch fest sounds like an amazing idea! Great interview! I can't wait for her next books to come out. I've been seeing posts about rouge all around FB. Good interview and congrats to Leigh. Oh, my stinking excited!!! LOVE Leigh! I've read both her books and she's spot on. Great interview, ladies. Leigh is great (and an agency sister now.) :) I've got fingers crossed on her next project! The contest sounds great -- I'll be looking forward to the details! Also, I LOVED hearing more about Leigh! In the past few months I've started reading her blog. Please enter me in the giveaway of ROUGE. Great interview! I love the premise of Rogue and the New Orleans setting should be a lot of fun! Rouge sounds so atmospheric - what a rich setting. Congrats to Leigh, and thanks for the interview, Natalie. I don't know how she can keep all of those plots straight. Congrats on all your success! Thanks for another great interview, Natalie. Cool to hear about Matt MacNish and Hart Johnson helping in getting the grit in. Nothing like good friends to help kick a story into gear. And excellent cover to The Truth of Faking! Wow, the WriteOnCon peeps never cease to amaze me with the wonderful things they do! And yay for Leigh! 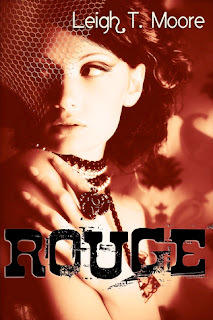 Rouge is on my to-read list and from the peeks I've taken at it I know I'm going to love it! Good luck and hope Eric finds a home for your next book. Great interview, Natalie, thanks. Leigh seems amazing. Congrats on ROUGE--it looks like a wonderful read! I loved Faking and can't wait for the sequel. I also have Rouge, which is near the top of my TBR pile. Great interview! I love the part about the five senses. So often that gets missed! Woo hoo on the midwinter WRiteOnCon pitch! I've read both of LTM's books, and they are both amazing! I'm actually reading Rouge right now, and loving it. And Leigh is one of my best friends ever, so she can email me any time! OMG!!! I've been out of town and just rolling in and checking comments, and all I can say is it just warms my heart and makes me a little misty to see so many friendly faces up above me here ^ . I actually bought Rouge around when it came out. I think it sounds incredible, I just need to fit it in! Hopefully soon! I loved learning more about the author and her journey though. I think when two books come out close together one sometimes gets neglected. I actually hadn't heard of her other book but have seen a few reviews of Rouge. Great interview ladies! Thanks for sharing! 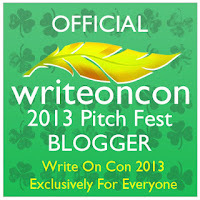 The writeoncon team never ceases to amaze me- that pitch contest sounds awesome! And what a great interview! I really enjoyed TTAF and it's true, that novel did seem to go viral without a lot of help. I've heard awesome things about ROUGE but haven't had a chance to read yet- it doesn't help that I am currently without-kindle:( Haven't read nearly enough these last few months. Great job Nat! 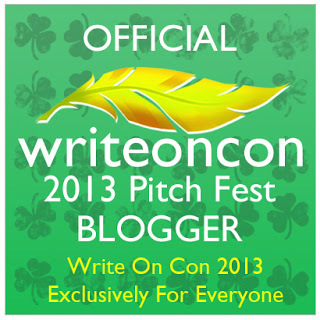 How cool about the pitch contest on WriteOnCon! Something I need to get enter. Such a great interview. Such an exciting literary journey. GOOD things are definitely in store for you LB. ALL The best with Rouge and your new novel! Awesome! Learned some new stuff about Leigh. Glad to know about the new agent and love the advice she gives! Cool about the WriteOnCon pitches too! Wow!